DiskSavvy Ultimate is a powerful, fast and easy disk space analyzer allowing one to analyze disks, network shares and NAS storage devices. 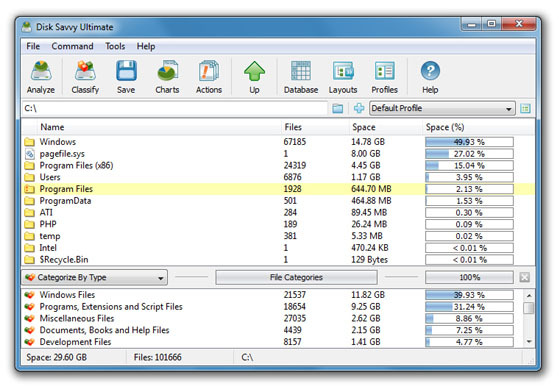 The user is provided with the ability to analyze one or more directories, disks or network shares, detect directories and files holding significant amounts of the disk space, display pie charts, export disk space usage reports and perform multiple file management operations such as file copy, move and delete. ...... The user is provided with the ability to analyze one or more directories, disks or network shares, detect directories and files holding significant amounts of the disk space, display pie charts, export disk space usage reports and perform multiple file management operations such as file copy, move and delete. Qweas is providing links to DiskSavvy Ultimate 3.2.16 as a courtesy, and makes no representations regarding DiskSavvy Ultimate or any other applications or any information related thereto. Any questions, complaints or claims regarding this application DiskSavvy Ultimate 3.2.16 must be directed to the appropriate software vendor. You may click the publisher link of DiskSavvy Ultimate on the top of this page to get more details about the vendor.